A unique pesto that incorporates the treasured Hatch Chile produced in Southern New Mexico creating the perfect Chile loving balance of smoky flavor, spice and heat. Use it just like you use traditional pesto, the options are limited only by your imagination. To get you started, spread on deli sandwiches, toss in your fresh garden salad, add to casseroles, sauces and marinades or top off grilled meats. Adds a flare of flavor to any dish. Ingredients: Hatch Green Chiles, roasted green bell peppers, roasted yellow onions, olive oil, garlic, cilantro, parsley, salt, spice, black pepper, citric acid. 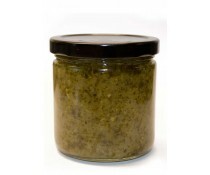 Click the button below to add the Southwest Hatch Green Chili Pesto (8 oz. )- DISCONTINUED to your wish list.